Welcome to the website of DLZ »Zelezna cesta« railway enthusiasts society of Ljubljana, Slovenia! We exist since early 1991. Our activities are both internal and public (fairs, meetings) and are mostly in Slovenian language. We invite you to browse the galleries here and on our Facebook profile. You are also very welcome to get in touch, either through Facebook or through the form below. We are prompt with our replies and will do our best to answer all your questions or point you to the right direction. You may get in touch regardless of whether you are interested in our club and its activities/events themselves, or in other railway related topics in Slovenia in general. A detailed map of the Museum grounds shows all buildings and areas where activities take place. 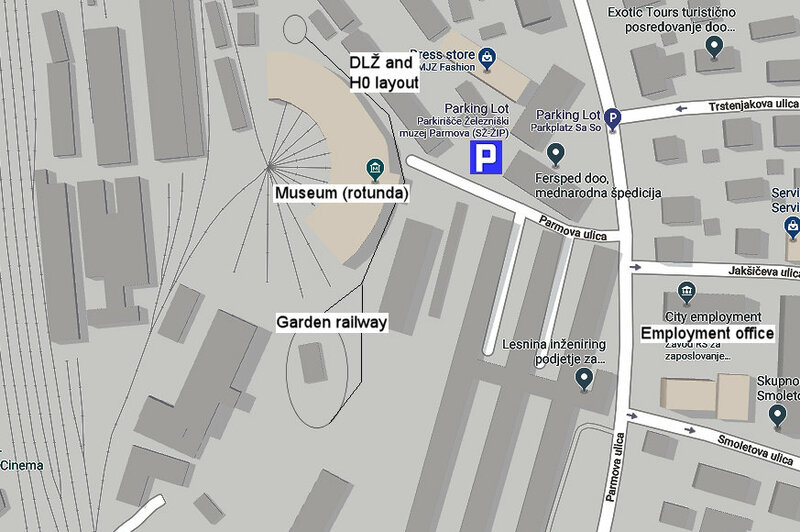 Also click here for a Google map of the area for easier access to the Museum. The Museum is approximately 50 meters away from the Parmova street, almost opposite of the Employment Service of Slovenia (ZRSZ). The main Museum building is the rotunda with museum track signals just by its entrance. Parking in the museum is free during our public events. You can also park on Parmova street and connecting alleys. Street parking is free on weekends and after 17.00 on workdays. The closest bus (Ljubljana public transportation – LPP) stop is Gospodarsko razstavisce on Dunajska street, served by more than 10 bus lines. Security code (spam prevention). Please enter the symbol sequence shown into the field below.